On Occasion of Buddha Purnima Guruji Shri Narendra Babu Sharmaji played the video on Sacred city of Auradhapuram. The city of Anuradha was founded in the 5th century BCE and remained the capital of Sri Lanka for 1400 years. The city is surrounded by four large reservoirs the largest of which is the Nuvaravava. The Tissavava now provides the modern city of Anuradhapura with its drinking water. All the reservoirs are fed by a channel constructed in the 4th century CE which leads water from the Kalavapi River about 50 miles from the city. Like Lhasa, Kyoto, Xian and several other ancient Buddhist capitals, Anuradhapura was a city surrounded by and to some degree dwarfed by a number of huge monasteries and several other smaller ones. The history of Buddhism in Sri Lanka up to the 13th century is to a very large extent the history of Anuradhapura's three great monasteries: the Mahavihara, the Abhayagiri and the Jetavana. The Mahavihara or Great Monastery was founded by Venerable Mahinda himself and Theravadins in Sri Lanka, Burma, Thailand, Laos and Cambodia even today subscribe to the Mahavihara's interpretation of the Pali Tipitaka. The ruins of the Mahavihara consist of a collection of 13 complexes covering a wide area. Unfortunately in the 19th century the town of Anuradhapura was built mainly over these ruins and many of them were damaged. In about the year 249 a new teaching from India called the Vetullavada was being enthusiastically advocated at the Abhayagiri. Some 300 of its monks disagreed so strongly with certain of the principles of this new teaching that they broke away and formed themselves into a new sect called the Sagalikas after their leader Sagala, a renowned scholar. King Mahasena appropriated some land owned by the Mahavihara and built these monks a monastery which was named Jetavana after the famous monastery in Savatthi where the Buddha used to live. The Jetavana stupa was the biggest ever built anywhere and their image house was the most impressive ever built in Sri Lanka. It seems that the Sagalikas were more liberal that the Mahaviharans but not as radical as the Abhayagiri. By the 9th century continual pressure from south India meant that Anuradhapura was no longer safe as a capital and political power gradually shifted to Polonnaruwa. But the city continued to be religiously important for at least another 200 years but eventually it died and was buried by the jungle. 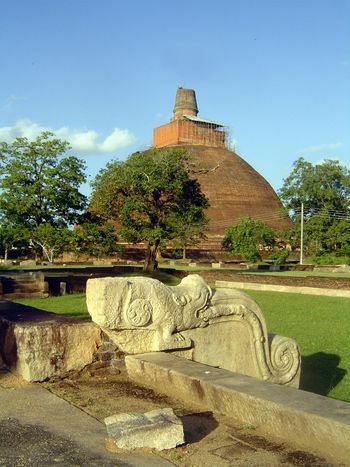 Although Anuradhapura was abandoned for a thousand years its sacred shrines were never forgotten. A few lone monks lived among the ruins and looked after the continual trickle of pilgrims who came. With the advent of the British and the general improvement in roads and the construction of bridges pilgrimage became much easier and for the first time in centuries large numbers of people started coming again. In 1834, Lt. Skinner who accompanied the governor on his inspection tour to Anuradhapura wrote. "The road from Kandy through Matale and Dambulla was crowded with pilgrims on their way to the Sacred Bodhi Tree". When he reached the ruins of the old city it was perfectly alive with people’. The Thuparama was a jumble of pillars and stones while the Great Stupa was little more that a steep-sided mound covered with thick jungle. Many places could not be identified at all. In 18xxx Anuradhapura was made a district capital and in 1904 the railway arrived. The sheer size and splendor of the structures that were uncovered began to awaken in Sri Lankans a pride in their past. The inspiration of Anuradhapura played a significant role in the independence movement and a renewed confidence in their religion. On the southern side of the Bodhi Tree are the ruins of the Mayura Pirivena first built by King Buddhadasa. It was here that Buddhaghosa resided during his stay in Sri Lanka. Buddhaghosa was the Indian monk who was invited to the island to update, systemize and render into Pali all the ancient Sinhala commentaries. In doing so he also turned Theravada has into a single monolithic system. Buddhaghosa's famous Visuddhimagga, his compendium of the doctrine, remains to this day the most widely read and studied of all Theravadin writings and his commentaries are the standard by which Theravadin orthodoxy is judged. Buddhaghosa himself described the Mayura Pirivena as "beautifully appointed, agreeably endowed, with cool shade and with an ample water supply". Today only a few calved pillars remain of the Mayura Pirivena and other parts of it may still lie buried under the nearby bungalow. After the first Sri Lankan youths were ordained, Anula, one of Devanampiyatissa's sub-queens and several other noblewomen expressed the desire to become nuns. According to the Vinaya women have to be ordained twice; once by monks and again by nuns and as no nuns had accompanied Mahinda to Sri Lanka a message was sent back to King Asoka requesting some nuns to come. With this message was also included a request for a cutting of the Bodhi Tree, the very tree at Bodh Gaya that the Buddha had sat under on the night he was enlightened. So it was that the following year a group of nuns led by Sanghamitta, the daughter of King Asoka, arrived in Sri Lanka with a cutting of the famous tree. On passing through the gate the pilgrim enters a large compound surrounded by a high thick wall made up of large rough cut stones. Some of these stones are placed on angle to create triangular holes in which lamps are burned during special festivals. This wall was built by King Kirti Sri Rajasingha after he received reports that elephants were damaging the Bodhi Tree. All the other buildings within the compound are recent and of no interest. Along the north side of the wall is a line of steles recording donations that have been made to the Bodhi Tree over the years. In the middle of the compound are a series of terraces which one should ascend on the north side. The two guard stones at the foot of the stairs are particularly fine and to the right of it is a bronze statue of Sanghamitta donated by the Buddhists of Thailand. At the top of the stairs the pilgrim will see the highest and smallest terrace surrounded by a fence made of 18-carat gold. There are several shoots and branches of the Bodhi Tree but what is believed to be the original cutting brought from India can be seen on the north east side of the terrace supported by brightly painted crutches and with its trunk wrapped in yellow cloth. Leaving the northern gate of the Bodhi Tree the pilgrim will see on the right a veritable forest of stone pillars, forty rows of forty pillars each. This is the remains of the Brazen Palace or Lohapasada first built in the 3rd century BCE by King Tissa and later redesigned by Duthagamani as the chapter house for the Mahavihara. The Brazen Palace was nine stories high, with a thousand rooms and got its name from the sheets of gilt copper that covered its roof. Being made mainly of wood it burned down and rebuilt several times and restored for the last time by King Parakramabahu I. Leaving the Brazen Palace and proceeding north along the path the pilgrim will see the foundations of a building off to the right. This is the remains of one of the Mahavihara's several refectories. With so many monks around Anuradhapura it was simply impossible for them all to be sustained by begging for alms so each monastery usually had huge dining rooms like this one below. Monks who were entitled to eat in such places were issued with wooden ration tickets. The main entrance leads to a large paved rectangular courtyard which was originally surrounded by a pillared verandah under which monks used to sit, probably on mats on the floor or on wooden benches. Note the drains where there would have been facilities for the monks to wash their bowls and their hands after their meals. Against the east wall of the refectory is a huge stone trough made of several pieces of stone so finally finished that they fit together perfectly. In the Mahavamsa such troughs are called rice boats. Steaming rice was tipped into these troughs and then doled out to monks as they lined up and walked passed with their bowls. It has been calculated that this particular trough would have held enough rice to fill 3,800 bowls. Returning to the main path and continuing north the pilgrim soon arrives at the eastern entrance to the Sri Lanka's most sacred stupa. After Dutthaamani made himself king in 161 BCE he began an extravagant building program. His most ambitious project was a huge stupa which came to known as the Ruvanvalisaya or simply as Mahachatiya, the Great Stupa. Dozens of architects submitted designs for the stupa but one after the other these were rejected. Finally one architect when asked how he intended to design the monument called for a bowl of water, scooped up some of it and let it flow back into the bowl so that it formed a bubble. "I will make the dome of the stupa like that" he said and his design was accepted. Foundations of brick and stone more than 20 feet deep were laid and to make them more firm teams of elephants were repeatedly driven back and forward over them. Dutthagamini was determined that he should have all the merit from this work of piety for himself so he made sure that everyone who labored on it was well paid. As the stupa moved towards completion, Dutthagamini went into decline and it became clear that he would not live to see his masterpiece. Out of pity for the old monarch his brother and heir Saddhatissa had white cloth stretched over the uncompleted parts of the stupa; he was carried out to see it and then died thinking it was finished. When the Ruvanvalisaya was finally completed it was one of the wonders of the age; with a diameter of 294 feet at the base and a height of 300 feet. The famous stupa at Sanchi by comparison which was built at roughly the same time has a diameter of 120 feet and a height of 54 feet. Mount the stairs to pass through the gatehouse of which only the pillars remain. Such gatehouses are at the four directions around this and all other stupa. Note on the right a trough where pilgrims could wash the dust of their feet before entering the sacred precincts. The retaining wall of the stupa's platform is made up of a line of elephants which although much restored are substantially the same as the originals. Climbing the stairs and passing through the inner gateway the pilgrim enters the vast paved courtyard. On the right end of this modern temple is an inscription of King Nissankamalla in beautifully inscribed letters. In it this monarch records some of the many good deeds he did to make himself popular with his subjects. He had himself, his son and queen weighed against gold and jewels and then gave it all to the poor. Proceeding further one will come to a kind of screen put up at the four cardinal points around stupas so as to serve as focal points for the worship. Flowers and lamps were offered here and garlands were hung on the hook-shaped protrusions. This first screen is a modern copy of the original. A little further along is a model of the Ruvanvalisaya. Popular legend says that this model was used as a guide for the architects when they were building the original; in fact it dates from about the 7th century. The next screen the pilgrim passes is an ancient one and may date from the time of the stupa's construction. Further along is a huge stone trough once used for holding water used for washing and refreshing flower offerings and now used for whitewash. This elegant little stupa was the first such monument in Sri Lanka and was built by Devananpiya Tissa to enshrine the Buddha's collarbone. Being such a revered stupa the Thuparama often generously endowed by wealthy patrons and kings but not all the attention it received was welcomed. It is said that once the famous monk Jotipala pointed out to King Aggabodhi II that the Thuparama was in urgent need of repair. The king removed the relic but then kept putting off the promised repairs. Jotipala became convinced that the king had decided to keep the sacred relic for himself and it was only after threats of terrible dreams from Jotipala that the king finally repaired the stupa and more importantly, returned the relic. During a fierce power struggle between Dathopatissa and Aggabodhi III both parties looted monasteries in order to get funds to carry on their struggle and Aggabodhi even broke open the relic chamber of the Thuparama and stole the golden caskets and other treasure inside. The stupa was originally paddy heap shaped but was rebuilt in the bell shaped form in the 19th century. It sits on a circular platform and is surrounded by four concentric circles of octagonal pillars each diminishing in height from the innermost circle. These pillars once supported the dome over the stupa which was built in the 6th century. The tallest pillars are 22 feet 10 inches long and are masterpieces of the stone mason’s art. At the entrance of the Thuparama is a very fine stone trough. This trough would have originally been placed under a spout which filled it with water and its undulating lip would have created numerous streams of water allowing many devotees to wash themselves at the same time. Just a little to the southeast of the entrance to the Thuparama are the remains of several of its subsidiary temples. The capitals on the pillars are shaped like vajras suggesting that at least during one period Tantra was practiced at the Thuparma. Wander around the back of the Thuparama and the pilgrim will see the ruins of an attractive temple and yet another stone medicine bath. Leaving the Thuparama and proceeding east down the road the pilgrim will soon begin to walk passed the now barely discernible walls of Anuradhapura's citadel. These walls were 18 feet thick in parts and about 4 miles long. A smaller road turns off to the left and passes through what was once the main south gate of the citadel and roughly follows its main ancient north south thoroughfare, the famous Mangulmaha Street. Archeological investigation have shown that the gate had two entrances, one for incoming and another for outgoing traffic and that the road was 57 feet wide. The main gate to the city was on the eastern wall and its immense ruins are still visible. In a deep depression are the ruins of an unusual structure built on a cross plan and with numerous stone windows. 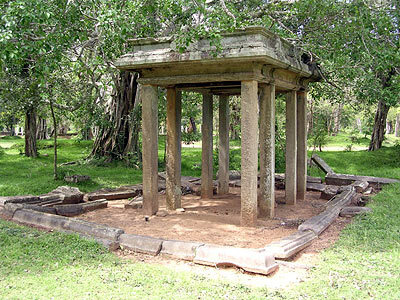 This and several other structures in the area represent the remains of Anuradhapura's Temple of the Tooth, perhaps the most famous temple in the ancient Buddhist world. The Chinese pilgrim I-tsing mentions that a little before his time another Chinese monk had been so enamored by the Tooth that he actually tried to steal it. But the relic casket was attached to a kind of mechanical device so that when it was moved an alarm went off and all the doors closed. The monk was caught and was only saved from the most extreme punishment by his yellow robe. Apart from its sacred relic the Temple of the Tooth was also famous for the enormous ruby set on its highest spire. When Hiuen Tsiang was traveling down the east coast of India he was told that the red hue he could see in the sky towards evening was the light from this gem. This gem later passed into the hands of the kings and may have been the same as the one that Marco Polo was shown in the 13th century. A little beyond the Temple of the Tooth is the remain is the Mahapali Refectory which was a part of the royal palace. Fa Hein came here when he was in Anuradhapura and noted that 6000 monks were fed every day at the king's expense. The modern pilgrim will notice a huge stone rice trough which has two inscriptions on its eastern end. The first reads, "For this Mahapali shall be taken from each sack brought into the city one pata of rice". The second inscription suggests that the monks who were usually fed here decided to forgo their usual dole so it could be used to feed workmen who were repairing a stupa. It reads "We all of us who receive food from at the Mahapali have given our share of rice for the new works being carried out on the Jetavana Stupa. Those who violate this shall take upon themselves the faults committed by the inhabitants of this land". Along the eastern side of the trough is a third inscription of the person who donated it. It says "This stone boat was constructed by Salavaduna who guards the shrine where the Dhammasanghani is kept". The Dhammasanghani is of course the third book of the Abhidhamma Pitaka. Returning to the road and continuing to head north the pilgrim will eventually pass through what was the northern gate of the citadel and enter what was the southern edge of the Abhayagiri, the second of the three great monasteries around Anuradhapura. The opulence and splendor of this monastery is hinted at by the Twin Ponds, which the pilgrim will soon encounter. As several thousand monks and staff lived at the Abhayagiri proper bathing facilities were necessary and the Twin Pond is the most impressive of the several such baths in the monastery. The Twin Ponds date from the 8th century, the larger one being built first while the smaller one was added some time later. The larger pond is 132 feet long while the smaller one is 91 feet long and both are 51 feet wide. Each pond has a flight of stairs at each end as well as steps around their sides allowing that many people could bathe at the same time. The size of some of the stones and their finish is impressive. At the far end of the ponds the pilgrim will notice the sophisticated filtering device. Water flowed into the first part where sticks and leaves were trapped and then into the second part which allowed silt to settle before finally flowing into the pond via a dragon-headed spout. Next to this spout is an impressive naga stone. Nagas were mythical creatures who were believed to live in the watery depths and stones honoring them were always placed near sluices, fountains and waterspouts. The water then flowed from the smaller into the larger pond through a duct some way towards the bottom of pond. After being used for washing the water was carefully channeled out to the adjoining rice fields. Near the north west corner of the ponds is a spout where people washed their feet before bathing. Continuing west along the road the pilgrim will come to a large and much weathered Buddha statue. This statue dates from about the 3rd century and may be the one Fa Hien mentioned seeing and that is sometimes referred to in the chronicles as The Great Stone Image. Excavation has shown that this statue was one of four that were originally placed with their backs to a Bodhi tree. Until recently the statue was surrounded by trees and covered with fallen leaves and moss and the occasional monkey would amble up and sit in its lap. It used to be a wonderful experience to suddenly come across the statue as one walked through the silent forest. Now the large restored nose, the barbed wire fence, the nearby toilet block and the trinket stalls means the statue is hardly worth a look. Just beyond the samadhi Buddha is the Abhayagiri’s massive stupa, now being repaired. 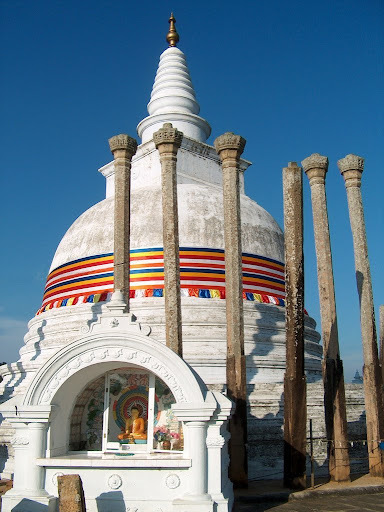 Further along the road from the stupa is a small temple with the most beautiful moonstone to be seen at Anuradhapura. Note the whimsical wide-eyed dwarfs on the stairs. This huge monastery was built by King Kanitthatissa for the monks of the Dhammarucikas, a sect that broke off from the Abhayagiri. The Mahavamsa tells us that Mahinda II repaired this monastery in the eighth century. At the left of the stairs leading to the monastery is an exceptionally fine guard stone. And on the left and a little further along is an immense pillar giving some idea of just how impressive this monastery must have once been. A little beyond the Dhammaruchi Monastery is perhaps the most charming building to survive from ancient Sri Lanka. It is not known what this pavilion was for but I imagine that it was originally set in a beautiful garden and was used by monks for quite study or meditation. The Jetavana stupa, is the largest stupa in the Buddhist world in both its dimensions and its mass. It is 231 feet high up to its broken pinnacle and it has been calculated that it is made up of 160 million bricks. At present the stupa is being renovated although the work it likely to take many years. This building with its entrance facing the stupa was the main image house of the Jetavana Monastery. The image, a standing Buddha at least 37 feet high, originally stood on a stone lotus pedestal and below it the pilgrim will see the numerous square chambers which contained the many precious stones and relics enshrined under the image. All the walls including the circumambulotry passage around the image would have been covered with paintings and the door frames must have once held enormous calved and gilt wooden doors. This temple started as a monastery, then became a part of a royal pleasure park and from its reoccupation during the 19th century became a monastery again. On the boulder above the back left hand corner of this pool is carved several elephants who look as if they are coming to bathe in the water. In the boulder above and a little to the left of the elephants is a niche in the rock in which there is a figure of a man in the 'royal ease pose' with a horse peering over his shoulder. An enormous amount of ink has been used trying to explain what these figures represent. Whatever it’s meaning the figure shows distinct south Indian influence. Most of the sculpture in the temple's museum is of a secular nature. The most famous piece in the museum, usually called 'The Lovers'. It shows a young warrior (note the sword and shield behind him) with his arm around his girlfriend. She has her finger raised in admonishment, which seems to be coyly urging him to desist. The couple are wearing large earrings of the type that were popular between the 6th and the 8th centuries in Sri Lanka. 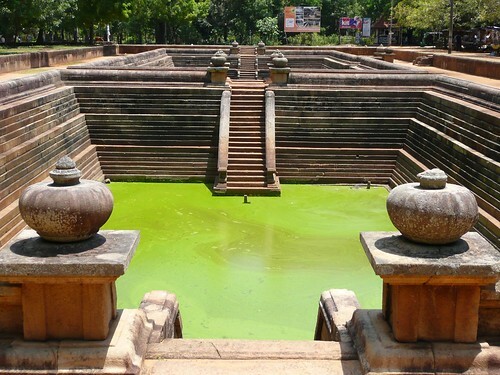 If the pilgrim goes behind the Issarasamana to the bund of the Tissavava and walks along it a little to the north he or she will arrive at the Goldfish Park, the most well preserved of Anuradhapura's royal pleasure grounds. The park was situated below the Tissavava so that water could be channeled into its ponds and fountains. On the west side of the bath is an alcove with a stone couch in it. A curtain of water flowed over the entrance to the alcove. The second bath has a bolder on the west side of the path bath calved with images of elephants frolicking in amongst lotuses. The line of rocks behind the two baths originally had pavilions All around the park are to be seen a highly sophisticated system of underground and overhead pipes, sluices and cisterns. When the baths were surrounding with flower beds and flowering trees and vines it must have been a particularly delightful place. One inscription says that after water comes out of the sluice it should be directed through the Goldfish Park, the plantain garden, the pond in the park and the water lilly pond. And then it is used to irrigate fields owned by the Issaramuni monastery. This is where Dutthagamani's only son prince Sali met the untouchable woman Asokamala and renounced the throne out of love for her. The park was 35 acres and was surrounded by a wall. Anuradhapura is 250 km (155 miles) north of Colombo. There are plenty of Colombo-Anuradhapura buses each day; you can either catch an older style bus or catch an inter-city airconditioned bus. Trains also go to Anuradhapura.